FLV to PSP Conversion: How to convert FLV to PSP video files? How to convert FLV files to PSP MP4 video files to let you watch your favorite FLV video files on PSP? This article will show you an easy-to-use FLV to PSP converter program to help you convert FLV to PSP videos. 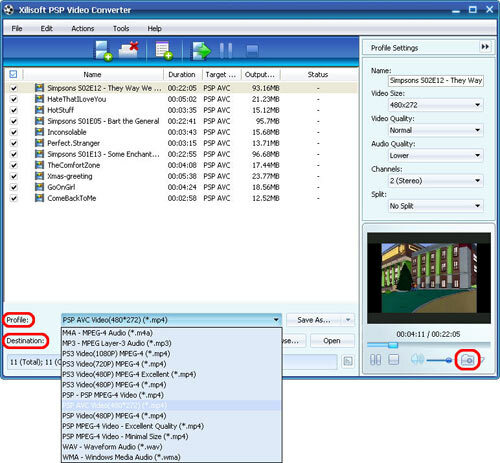 Xilisoft PSP Video Converter is a powerful video converter for PSP users to convert video files like FLV to PSP videos. Besides converting FLV to PSP, this PSP video converter also supports converting AVI, MPEG, MKV, WMV, MOV, RM, MP4, etc. videos to PSP MPEG-4, PSP AVC, PS3 MPEG-4 (480p, 720p, 1080p) videos. Step 1: Download Xilisoft PSP Video Converter. Install and run it. Step 2: Load FLV video files. Click "Add File" button to load your FLV files. Click to highlight files you want to convert, click "Profile" drop-down button to choose a proper PSP profile as your output format. Click "Browse" button to choose destination folder for saving your converted PSP video files. Reset parameters: Click "Advanced Profile Settings" button to set various parameters for satisfying your needs. Add another profile: Select a video and click the "Add Profile" button to choose another profile as your output format. In this way, you can get several video files with different profiles. Click "Convert" button to convert FLV to PSP. Ok, done. After the conversion is completed, you can put the converted FLV videos on your PSP. How to put converted FLV videos on PSP? PSP System is using Memory Stick Duo to store games, music, videos and other content.